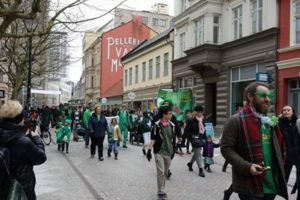 St. Patrick’s Day Parade a Roaring Success! 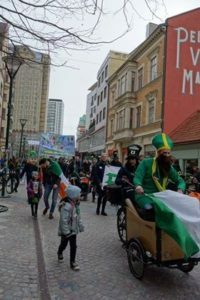 It may have been a day early but Malmö’s St.Patrick’s day parade was no less fitting as about 100 attendees gathered at Triangeln to be led on their way by the patron saint of Ireland. 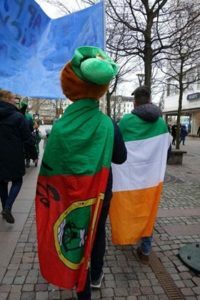 While the Irish from Malmö and the wider Skåne community and their Swedish hosts made up the bulk of the parade, other countries were well represented. Argentina, Australia, Germany and England, amongst others were marked “Anseo” to make this a truly international affair. 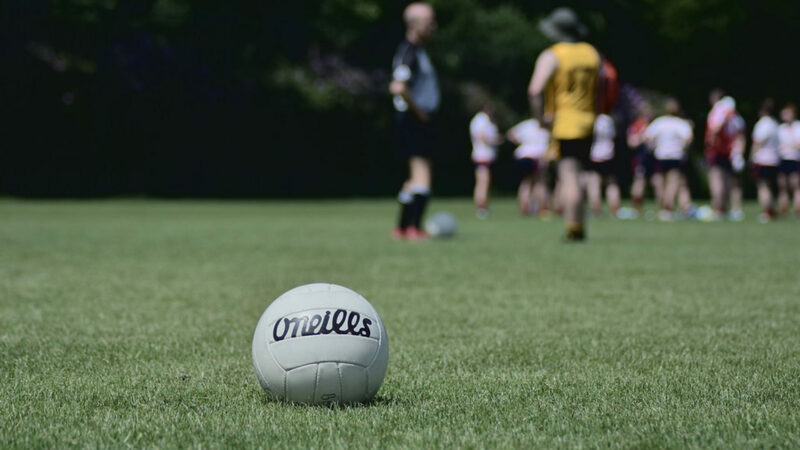 Malmö GAA club were the chief organisers but were aided in their efforts to put on a show by their antipodean counterparts and local AFL side Port Malmö Football Club. 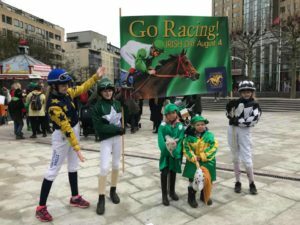 Jägersro Gallop were also in the saddle to advertise their Irish racing festival on the 4th of August this year. Club sponsor Fagan’s was present as was Casey’s Fish and Chips to help to swell the numbers. 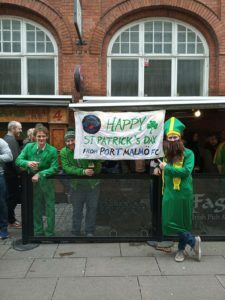 Those partaking began assembling at 13.00 by the fountain when St.Patrick himself appeared from behind the shopping centre on a cargo bike bedecked in the Irish Tricolour. From there it was time to get the official party started. Some members from the club we on hand to paint flags and shamrocks on children’s faces. 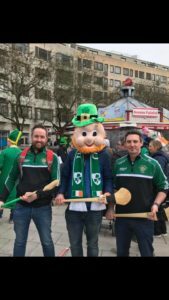 Members of the Viking Gaels pucked a few sliotars around as a giant leprechaun played irish music on a giant speaker. With many old friends meeting up for the first time in a year or so there was a great feeling of togetherness which helped any new faces blend seamlessly in with the crowd. Children in green ran and played while eating sweets as the adults watched on drinking tea and coffee. 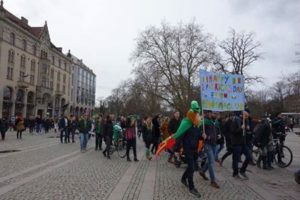 As 14.00 approached St.Patrick positioned himself at the front of the group and blew the whistle to get everyone on the march down Södra Förstadsgatan. The parade was met with smiles and the odd applause as well as a few looks of bewilderment. 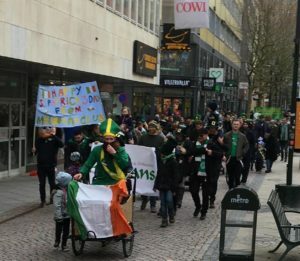 Some minor works to the street didn’t hinder progress but the parade felt like the island of Ireland at one point as the group at the back were cut off from the main pack by the lights at a pedestrian crossing. Luckily, it was a parade once again on the other side of the canal as it ambled through a vegan demonstration; perhaps a welcome distraction for some of its less serious participants. 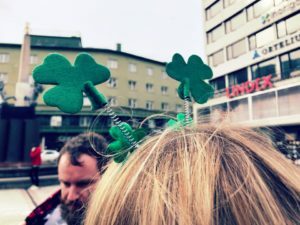 Onwards then through Gustav Adolfs Torg where more locals watched on as the Paddies and Paddies for a day took the final leg of their journey. Here they stopped for a few group pictures before rounding the corner to Fagan’s and a much needed drink. Live traditional music greeted the revellers which stopped only for the Ireland v Wales rugby match which ended in bitter disappointment for the men in green. Alas, spirits weren’t dampened and the party continued in Fagan’s until well into the small hours and all going well next year’s parade will be bigger again.